This is yet another treasure from the HPB bargain bin! I think most of us are familiar with the music of Frank De Vol. We've heard it in lots of movies and lots of television series. Well, this album has some great movie and TV themes as played by Frank De Vol and his orchestra (but couldn't they have thought of a better, shorter album title?). He co-wrote three of the themes on this album - "My Three Sons" (one of my all-time favorites), "Hush, Hush Sweet Charlotte", and "Give Me a Souvenir". 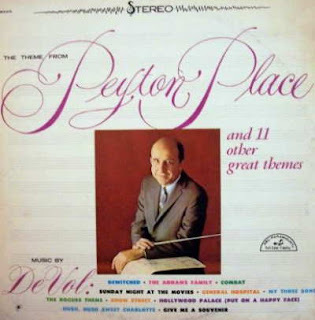 And I absolutely love his arrangement of the theme from "Peyton Place" - one of my favorite TV shows when I was a very little girl (I barely remember it). And "Combat" - I LOVE this TV show, and watch it every evening on the ALN channel. When I was a little girl, my father bought me a plastic tommy gun and I used to play "Combat" in our backyard, hiding behind the bushes and waiting to ambush the enemy. 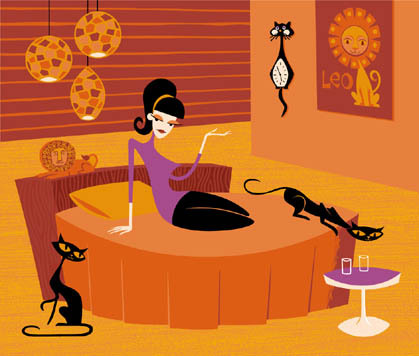 "Bewitched" - always loved Elizabeth Montgomery as Samantha! Anyway, I hope you enjoy this album as much as I did! Well, this album really brought back memories for me. This is one of the albums that my mom played a lot when I was growing up. I'd forgotten about it until I started going through my albums to see which one to post tonight. As soon as the first song started playing, I was taken back in time to my living room in my childhood home (which I still own, but it's been remodeled so it doesn't look the same). Once again, I was a little girl playing with my Barbies or coloring in one of my coloring books, while my mother listened to this record. I even remember that I would always ask her which one of the serenades (Sunrise or Penthouse) was which - I always got them mixed up. I was also pleasantly surprised at how well this album sounded - very little clicks and pops considering that my mom played it a lot. She even marked the back cover - there are plus (+) signs by "Deep Purple" and "Diane", a note by "Diane" that says "from Seventh Heaven" (a movie), and two check marks by "Falling Leaves" (I guess she really liked it). So, it was kinda neat to listen to this, and to see my mom's scribbles on the back cover. I hope you like this album as much as I - the songs are great and it's wonderful piano music to listen to! Happy Summer! I know it doesn't officially start until Friday, but I wanted to make sure that you start off your summer right with this new compilation I put together. I actually meant to post it last year (my first summer compilation was in 2006), but for some reason (that I don't know or remember), I didn't. So, I dusted it off, made some changes, and am now presenting it for your listening pleasure! Summer is my very favorite time of the year. I have great memories of it from my childhood, and I love the hot weather. I know lots of people can't stand the heat, but it doesn't bother me at all. I remember as a little kid, we used to be just fine with fans in the house. My house didn't have central air, and it wasn't until we'd lived there a few years when my parents finally bought a couple of window units. Of course, those were also the days when it was perfectly safe to sleep with your windows open and leave your front doors unlocked. Those were also the days when it was perfectly safe for a little kid to walk (or ride a bike) alone down to the neighborhood candy store. We really had it made in those days, didn't we? Anyway, I hope you like the songs I selected for this compilation. To download the first one I made, just click on the "summer" label and it'll bring it up. The link is still good. 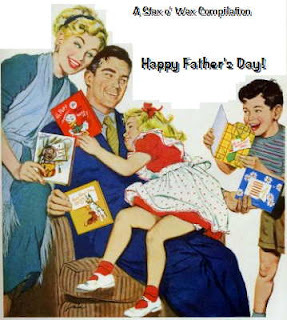 Happy Father's Day to all you dads out there! I know the day is almost over, but I hope you get a chance to download this and listen to the songs before the day is over. And for those whose dads have passed on (like mine), then I hope these songs bring back some happy memories of your time with your dad. Well, I hope you enjoy the songs I picked for this compilation. Some are very sentimental and moving, but there are also some fun ones. Enjoy! I really like Harry Belafonte, and I wish I had a better copy of this album. But, I haven't been able to find a posting of it, so I thought I would go ahead and record and post my copy. I ran it through the click removal five times, but there is still noise, and several of the songs have skips. So, if anyone out there has a better copy, please post it and let me know! This is one of Harry's early albums (I think it was his second), and the liner notes say that "most of the songs in this collection will be familiar to all". Well, I've only heard three of them, but the entire album is good. As the liner notes say, "great folk themes are immortal and timeless". The three songs that I'm familiar with (and thus my favorites on the album) are "Matilda" (makes me want to sing along), "Scarlet Ribbons" (it's so sweet it always makes me cry), and "Unchained Melody" (always a beautiful song). I hope you like these songs, and the rest of the album! BTW, the last four records (and this one) were recorded on my new ION USB turntable! I got the TTUSB05 and it works great! Also, I haven't received any comments on Sharlene Sharp. Doesn't anyone out there have any info on her or Sonny Look??? Here's an album cover with a couple of beauties! (I'm kind of partial to the blonde - she's so perky!) 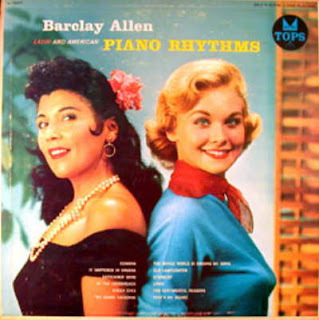 And the tunes are familiar standards performed by "one of America's foremost piano virtuosos", Barclay Allen. Allen was a pianist and bandleader whose brilliant career was tragically cut short by an auto accident. He was a mainstay with the Freddy Martin band before forming his own highly successful orchestra. He became popular for his Latin-esque theme song, ''Cumana,'' which he co-wrote with Harold Spina and Roc Hillman. In 1949 Allen was paralyzed when he lost control of his car while driving all night between performances. This copy of the album has had its share of being played a lot, and I tried to remove the clicks and pops the best I could, but it still has some noise. Also, the first song on the second side has some skips. But, I think it's still well worth a listen - Barclay Allen could really tickle the ivories! Well, here's a doozy of an album cover! My friends, Dan and Bradley, gave me this record this past Christmas, and they said they chose it because it was such a weird cover. They know me too well. I have to admit I was a little afraid to play this record for fear that it would be absolutely awful, but today I decided to record it for the blog and it's not as bad as I thought. I'm not saying it's wonderful - I'm just saying it's not as bad as I feared. But the cover makes up for it! Who the heck thought up this cover??? You can tell that Sharlene is pasted in there - she's not really sitting on that horse! And what's with the jousting outfit on the horse? Poor thing looks like he's one of the horses at Medieval Times. It's a pretty funky cover, all right - I'll be framing it and hanging it in my entryway - I'm serious! I have absolutely no idea who Sharlene Sharp is (I'm assuming she's still with us), and I could find no information about her on the internet. But I did find out that Sonny Look had a famous restaurant in Houston called the Sir Loin Restaurant and Club, and that he died in 2003. 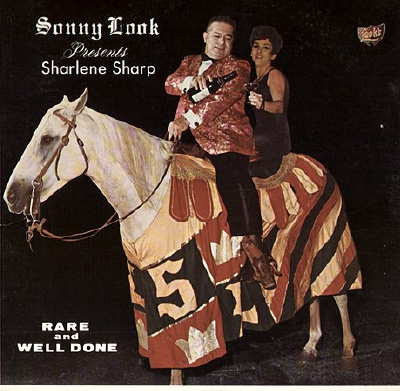 I figure that Sharlene must've been an entertainer at his restaurant and he thought she was just wonderful so he had her record this album. The only other information I have on this album is that the liner notes were written by Mel Arvin (must've been a local Houston celebrity), and that the album was recorded by ACA Recording Studios in Houston. I don't know what year it was recorded but I'm thinking the late 60s, since "Sunny" was a Top-40 hit in 1966. If anyone has any info they can share about Sharlene and/or Sonny, please post a comment! So, give old Sharlene a listen. Maybe (if she's still with us) we can track her down and convince her to come out of retirement and record another album. Ethel Smith - Rhythm Antics! Here's another gem from the HPB bargain bin. 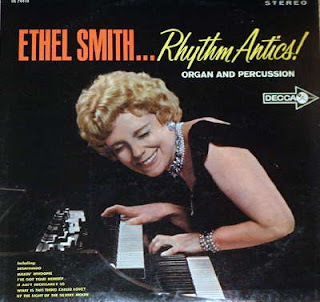 I'd never heard of Ethel Smith, but I love organ music and I couldn't resist the hilarious album cover - it just cracks me up! I have since found out who Ethel Smith was (good write-up on Space Age Pop), and have added this album as a must-play for my housewarming party. This is a great album to play at your next happy hour or cocktail party!